Anyway, Antonia (from season 4, Chicago) is going to be on this seasons Top Chef All-Stars. I was really bummed when she was sent home for poorly cooked legumes (see, I am a little obsessive about the show) and I’m really excited for her return. She won the “Uncle Bens” Quickfire Challenge with her Rice Salad with Seared Skirt Steak. It took me a while to attempt this recipe because even I can’t find mache (I mean seriously, I had to Google it – twice). Plus, I wasn’t sure how well the warm rice/salad combination would be received by Madison and Joel. 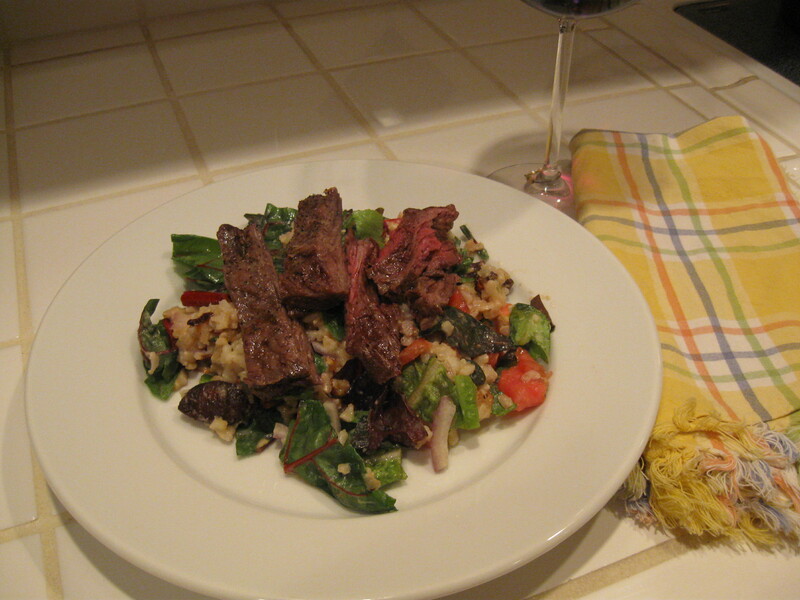 So I finally attempted the Rice Salad with Seared Skirt Steak with a few modifications. The result: it was an instant favorite on the family menu. In fact, I asked my Mom later if we used to eat this when I was a kid because the flavors were vaguely familiar. She said yes, it was “big in the 70’s”. And yes, she used to make something similar. Coat the steak with olive oil and season with salt and pepper. Grill to the desired degree of doneness, 3-4 minutes per side for medium rare. Set aside to cool slightly and slice into strips. Whisk eggs yolks, vinegar, ¼ tsp salt, sugar and canola oil. Stir in the cilantro. In a large bowl combine the mixed greens, tomatoes and onion. Mix in the rice and toss with the vinaigrette. To serve, scoop the salad and rice mixture onto a plate and top with the steak strips. I’ll expect some of this when I arrive on the 22nd.